If you have a user in ES5 you will be able to access the ABAP code via the following links. 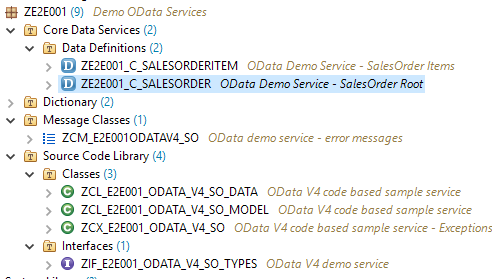 In this first blog about OData V4 code based implementation I want to show how to build a simple service that shows sales order header data alongside with its items. The service implementation will leverage two CDS consumption views ZE2E001_C_SalesOrder and ZE2E001_C_SalesOrderItem that read their data from the CDS interface views SEPM_I_SalesOrder_E and SEPM_I_SalesOrderItem_E respectively. By leveraging CDS views you will be able to reuse the data modelling part to a large extent in the new ABAP programming model once this supports OData V4 even if you are currently using AS ABAP 750. In addition your service will support most query options out of the box by using the code samples shown in this blog. In addition to the data provider class and the model provider class which are mandatory for an OData V4 service we will in create three additional repository objects for convenience (an interface) and as a best practice (an error and an message class). The interface is used to define types and constants that are used in both, the data provider class as well as in the model provider class. Examples are the types of the two CDS consumption views mentioned above or the ABAP internal and external names of our entity types, entity sets, navigation property, etc. This sample service has been implemented for your convenience in the new demo system ES5. System details can be found in my following blog.New SAP Gateway Demo System available. Navigate from the sales order head to the items and filter the result set for items with a grossamount larger than 1100$. Read a sales order header and expand the items therby filtering on the expanded items. We will start to create two CDS consumption views on top of two existing CDS Interface views that are delivered by SAP as part of the EPM demo data model. Please note that you have to activate both views together (Ctrl+Shift+F3). Afterwards you can select the sales order view and use (F8) to get a preview of the data. In the second step we create an interface zif_e2e001_odata_v4_so_types that will be used to store data types and constants that will be used in both, the model provider and the data provider class. It can also be used for other service implementations that reside in the same service group and that might want to leverage the information being defined in the interface to implement cross service references. types: begin of gty_s_so_soi . The message class contains three messages that are used in the exception class to raise error messages specific to your OData service. The message class will look like follows in ADT. SAP Fiori applications for example by default use query options such as $top and $skip. A single read on a sales order will also use the correct key that has been retrieved beforehand. Now that we have worked on the prerequisites we can finally start to implement our model provider class. As in V2 the model provider class contains a DEFINE method that is amongst others responsible to create the definition of our entity types and entity sets. The define method will call two entity type specific methods define_salesorder and define_salesorderitem that create the entity types and entity sets for sales order header and items. The most important method call is to call the method create_entity_type_by_struct which works similar to the DDIC import in SEGW in V2. Please note that we make use of our interface here since the ABAP internal name of the entity type is retrieved via the constant gcs_entity_type_names-internal-salesorder and the DDIC type from the type gty_cds_views-salesorder. Here we also set the key field of our entity type. lo_primitive_property = lo_entity_type->get_primitive_property( 'SALESORDER' ). And we create a navigation property in our entity type that points to the sales order items. Also here we use our interface to retrieve the ABAP internal and the external name of the navigation property gcs_nav_prop_names-internal-salesorder_to_items and gcs_nav_prop_names-edm-salesorder_to_items as well as the ABAP internal name of the target entity type gcs_entity_type_names-internal-salesorderitem. lo_nav_prop = lo_entity_type->create_navigation_property( gcs_nav_prop_names-internal-salesorder_to_items ). The data provider class contains the generic implementation of the basic interface methods for read access. These are the following methods. that have to be redefined. I will explain the functionality of these methods in the following. The complete code is shown in the following section. We start with the method /iwbep/if_v4_dp_basic~read_entity_list.which is for example called if a client accesses an entity set with a Get request, for example GET ….<service root>/Salesorder. We first have to retrieve the todo list via the io_request object. With this todo list we can check whether our service implementation has to retrieve parameters such as $top or $skip. io_request->get_skip( importing ev_skip = lv_skip ). io_request->get_top( importing ev_top = lv_top ). Please note that the name of the entity set is retrieved via the method io_request->get_entity_set and checked against the constant gcs_entity_set_names-internal-salesorder that has been defined in our interface. io_request->get_entity_set( importing ev_entity_set_name = lv_entityset_name ). The entity type specifc methods read_list_salesorder and read_list_salesorderitem both start with a definition of entity type specific data types that will hold the data being returned and (if being provided) the list of key fields retrieved via navigation. lt_key_salesorder  type standard table of gty_cds_views-salesorder. The code also uses our exception class since an exception will be raised if the client would try to send a Get request GET…/Salesorder without limiting the result set using either $filter, navigation or $top. In the end we are able to run a generic OpenSQL statement against our CDS view which supports most query options out of the box. Please note that the V4 API uses the method io_response->set_busi_data to return the business data to the SAP Gateway framework. io_response->set_busi_data( it_busi_data = lt_salesorder ). This time we first retrieve the name of the entity set that has been accessed using the method io_request->get_entity_set. Here we have to retrieve the todo list via the io_request object. This todo list will contain different flags than the todo list used by the read_entity_list method. We can for example retrieve the key from the incoming Get request in the ABAP internal representation. We then can simply read the data via a select single statement from the CDS view. If data has been found it is returned to the framework via the method io_response->set_busi_data. If no table entry is found we raise an error message.using our exception class. Please note that our coding is very generic so that it can easily be adapted to the CDS viewyou will use. io_request->get_key_data( importing es_key_data = ls_key_salesorder ). if ls_salesorder is not initial. io_response->set_busi_data( is_busi_data = ls_salesorder ). lv_salesorder_key_edm = lv_helper_int = ls_key_salesorder-salesorder. This method is called by the framework to determine the list of key fields in case navigation is used. io_request->get_source_entity_type( importing ev_source_entity_type_name = lv_source_entity_name ). Here we check for the source entity type io_request->get_source_entity_type and call an entity type specific method read_ref_key_list_salesorder. Please note that we are following the naming convention that uses the same name for the navigation property that is used as an association in the CDS view. After having checked the ABAP internal name of the navigation property (here: _ITEM) that is defined in the interface we retrieve the key fields (salesorder and salesorderitem) from the CDS view ze2e001_c_salesorderitem where the key field salesorder is equal to the source key field (here 0500000000). The key data is sent back to the framework which provides it to the read_entity_list method. io_request->get_source_key_data( importing es_source_key_data =  ls_salesorder_key_data ). io_request->get_navigation_prop( importing ev_navigation_prop_name = lv_nav_property_name ). What is left is to do the following. For more details see the SAP Online Help. Thanks a lot for sharing with all information. Most wanted blog on V4 development . Based on info you provided, you managed to connect to the Demo Gateway from Eclipse(ADT). What info you specified for that? Thanks alot for OData V4 implementation tutorials. Does the gateway support all the oData v4 functions such as “Groupby”? If not, is there a list of what is supported in each netweaver version?